One of the methods commonly used to analyze and investigate light propagation in perturbed coupled waveguides is coupled-mode theory (CMT) method. The basic idea of CMT method is that the modes of unperturbed (or uncoupled) structures are defined and solved first. Linear combinations of these modes are used as trial solutions to Maxwell’s equations for the complicated perturbed or coupled structure. This theory assumes the field of modes of unperturbed structures. In many practical cases, this assumption is valid and does give an insightful and often accurate mathematical description of electromagnetic wave propagation. CMT method is often used as a technique to obtain quantitative information on the diffraction efficiency and spectral dependence of fibre gratings. 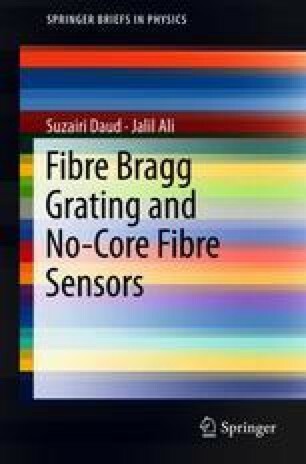 Due to its simplicity and accuracy in modeling and the optical properties of most fibre gratings, it is one of the most popular techniques utilized in describing the behavior of Bragg gratings.